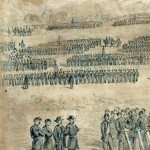 The New York City Draft Riots took place from July 13-16, 1863, in protest of conscription laws passed to fill the ranks of the Union Army during the Civil War. 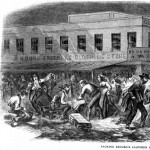 The riots involved working class men, many of them Irish, who believed that they carried an unfair burden in the bloody war while wealthier men were able to purchase substitutes to serve in the Union Army for them for the price of $300. The rioters also protested being drafted to fight to end slavery and targeted blacks in the city. Secretary of War Edwin M. Stanton ordered troops, some of whom had fought in the Battle of Gettysburg just days earlier, to New York to assist in suppressing the riots.